You may remember from the I am "Sew Crafty" and the Holly Homemaker posts that I am learning how to sew. I LOVE sewing - but I need a lot of help. The good news is my Grandma is going to teach me soon. I even bought my first pattern for a sundress. You better believe I'll show you that project when I'm finished. 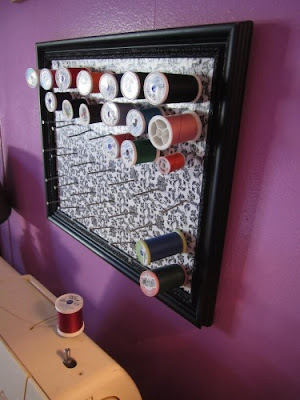 I found this great idea on Pinterest from Sew Knits. I knew I had to have something that cute near my sewing station in the sun room. So I started with the same fabric as I used for some pillows and a cork board. You can see them here in the Sew Cool post. Using a small staple gun I stapled the fabric tightly around the back. When I began adding the nails, I realized the fabric wasn't tight enough - there was too much bunching. I had some really cute pink pins on hand and after I tested it out - it was strong enough to hold a spool! Ok - I don't have a lot of thread. It was painfully obvious when I put all of my thread on the board. I even added my full bobbins, still too bare. With a little reorganization and some tilted pins for the skinny guys - it looked a little better. What do you think? Not too shabby, right? I love it! As my thread collections grows, I'm sure it will look even better. Great idea! I will do! Thanks for this genius idea!